This training course explains in detail about database, data warehouse, data modeling concepts, data modeling types and how these are used in OLTP environments and Data warehouse / Datamart Environments using Erwin, Power Designer & Oracle SQL Data Modeler. 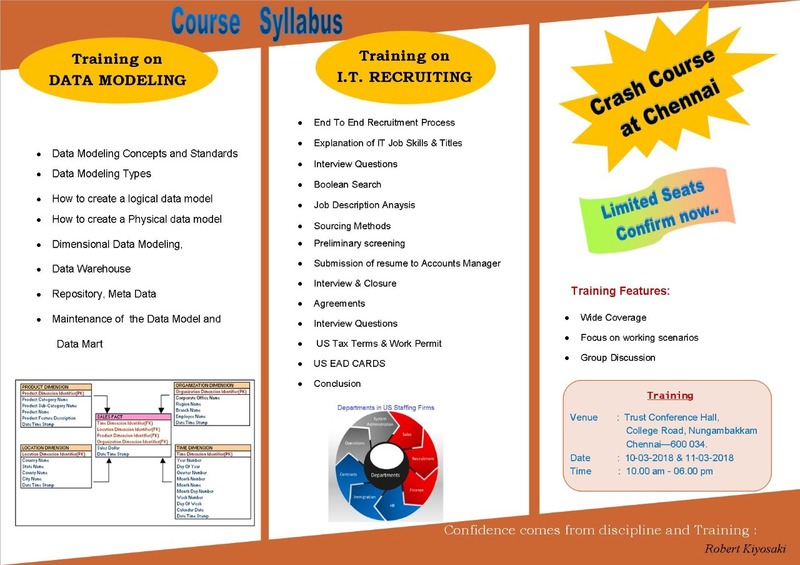 To get more information about this training program, send an email to Training@LearnDataModeling.Com 0r call us @ 91-9884675745. What is a Data Modeling? Who is a data modeler? What are the other alternative titles for a Data Modeler? What are the duties and responsibilities of a Data Modeler? What is the difference between duty and responsibility? How to generate scripts from a data model and share it with DBA? How to create a data model from a database? How to create a data model from a script? How to compare data models? How to compare database and a data model? Why do we need so many subject areas? How to implement Physical data model in a database? How to generate SQL Code? How to implement it in Database? How to maintain data in Lookups? What is a Data Mart? What is Snow Flake Modeling? What is Star Schema Modeling? What is Slowly Changing Dimensions? What is Dimensional Data Modeling? How to create a data model for Data Warehouse and Data Mart?